Cost to repair a drain line breakage varies greatly by region (and even by zip code). Get free estimates from plumbers in your city. Cost to repair a drain line breakage varies greatly by region (and even by zip code). The cost of reaparing a drain line breakage is between $360 and $1,290. How much does it cost to repair a drain line breakage? Dealing with a broken drain line 1 can be a major hassle for homeowners. 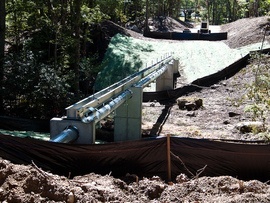 The drain line 1 transports wastewater to the sewer system. A drain line 1 is quite different from the sewer line 2, which is also known as the main drain line 1. All the drain lines 1 in your home that run under the house eventually connect to the sewer or main drain line 1, which transfers waste water from your home to the sewer system or to a septic tank. The main drain is the horizontal drain line 1 located underneath your home. It exits the perimeter of your house and is directly connected to the house sewer. Home plumbing systems and drain lines are as old as the house itself, meaning in some cases, that the pipes are decades old. Frequent exposure to water and other chemicals in its surroundings may cause the pipes to rust and wear out over time. Drain line breakage can also be caused by surrounding roots, animals or due to a serious clog that has backed up the pipes. Irrespective of its cause, drain line breakage needs to be repaired immediately. Problems, such as crawlspace and basement flooding, wet areas inside your home or on the property, and foul odors can be indications of drain line breakage. Drain line repair typically costs homeowners between $360-$1,290 depending on the cause and the location of the break, including whether the break is located inside or outside the house. The repair team you have hired must first determine the location of the break, and that there is indeed a break, and not just a clog. In most cases, your plumber will attempt to snake the drain from the main clear out near or in your home. If this does not work, a camera is fed down into the drain from the main clear out to determine where the break is located. If the break is close to your home, or you have a septic tank, repairing it is your responsibility. A break in the mainline may be the responsibility of your city or town; before you have work done, you will need to contact your city hall to find out who is responsible. In some cases, the town will need to pay the repair costs; in other cases the repairs will be your responsibility. Drain lines that are situated deep within the ground are difficult to access and are generally more cost-effective projects compared to home-centered projects. Just the cost of repairing the drain, without the cost of reaching it, will be around $100 more just for moving out of your home. If the break is situated outside your house, repairing will require excavation of the area above the pipe. This can be a costly and time-consuming process. This is because drain lines are buried several feet under the soil and can extend the full length of the property. Excavation costs can add around $1000 to the total, and the costs go up as you move further from the home; every 100 feet from the home will increase your costs by as much as $1400. So while a broken drain in your basement may cost $400 to repair, the same break 200 feet from your basement will cost you around $3,000. If the breakage has occurred inside your home, no excavation is necessary however, the floors, walls and ceilings are likely to suffer from flood damage. If the water leaked out from the broken drain has caused collateral damage to your house or property, water damage restoring will costs between $3.75 to $4.50 per square foot. Replacing drain lines is a costlier process than having the drain line repaired. Pipe lining or replacing the pipes, costs about $100 to $200 per foot. Homeowners will have to consider costs of pipes, fittings, mechanical couplings among others. Additionally, drain pipes that may require you to open up a wall or tear down a ceiling, which will increase the cost of labor, and the cost of repair. Costs of reaching inaccessible pipes start at $400, and may go as high as $1500 just to find the issue. Repairing the pipe then starts at $300, while replacing begins at $100 a foot. Simple cost of digging can cost $50 to $250 per foot. Replacing drain pipes by yourself is not an option and you will have to hire a professional plumber. Most plumbers usually charge between $45 to $65 per hour for their services. However, this depends on their skill and experience. If the location of the break is outside your house, plumbers may need to dig a hole and conduct proper excavation, which cost between $40 to $50 per hour. However, in most cases, you may have to hire a contractor. Most contractors typically costs between $50 and $60 per hour and is likely to charge between $672 and $835 for the project which might take 13-14 hours. A contractor will charge extra for restoring landscaping or filling the hole, landscapers cost an average of $45-$75 per hour hourly rate. Labor costs will include cost of materials and equipment, including service provider transportation. You may also have to hire someone for debris removal and cleanup, which will be charged between $50 and $60 per hour. Drain lines 1 can serve as a great source of oxygen, nutrients, and water for tree roots. Roots can find their way inside a pipe resulting in breakage and its repair can cost hundreds to thousands of dollars. As a preventive measure, take note of where the pipes are located and create a barrier between the drain pipes and the trees. Additionally, avoid planting trees near drain lines 1 or opt for slow-growing trees. Take preventive measures and know the warning signs; regular inspections and proper maintenance can reduce the risks of pipe breakage. To avoid major drain line 1 repairs and replacements, have the pipes cleaned regularly and inspect the structure. Basic drain cleaning can cost between $170-$200. Tree removal: The cause of the breakage can impact the cost of repair. Tree roots trapped in the pipes would require removal of a tree. The average cost of removing a tree is $700. Video cameras are now commonly being used by plumbers to inspect the condition of the pipes. A basic video camera inspection can cost $250. This is not a basic DIY project since it requires excavation of land and plumbing, depending on the cause of the breakage. DIY plumbing can result in new costs, hence it is advised you contact a professional carpenter or plumber. Follow the preventive measures such as using quality pipe materials and planting trees away from the drain line 1 to reduce the risks of complete line failure. If your house is situated away from the city line, costs can be increased by about $600 to $1,600 in case of a whole replacement. This is because of the added cost of materials. A majority of homeowner insurance policies don’t pay for drain line 1 repair. The municipality is unlikely to pay for the drain line 1 breakage even if they are responsible for the repairs. How much is trenchless pipe repair? The cost of trenchless pipe repair runs between $55 and $215 per foot to be repaired. How much does it cost to snake the main line? Snaking or cleaning the main line generally costs around $170-$200. How much does it cost to install a new sewer line 2? The cost of a new sewer line 2 runs between $1600 and $2500 on average. How much does it cost to line a sewer pipe 2? Relining a sewer pipe 2 costs around $160 a foot on average. How much does it cost to replace a sewer line 2? The cost of replacing a sewer line 2 ranges between $1600 and $2500 on average. How do you know if you have a broken sewer line 2? The most common issues associated with broken sewer lines 2 include foul odors and wetness or moisture in your basement or crawl space. How much does it cost to repair a drain line breakage in my city? Cost to repair a drain line breakage varies greatly by region (and even by zip code). To get free estimates from local contractors, please indicate yours. 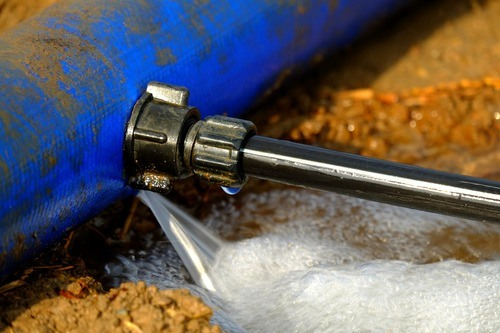 Cost Considerations: Cleaning a drain line is something that can be done by the homeowner. There is also the option to hire a professional, which can start at $75.